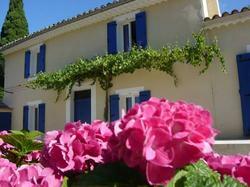 A house typical of Provence that has belonged to the same family for four generations. set amid market gardens. truffle oaks and forests of hundred year old olive trees.This building. formerly only offering Spartan comforts (no running water or electricity). was completely renovated at the start of 2009 to offer everything to make guests comfortable. You can relax in a 1000 m2 private and enclosed garden.Ideally situated in the centre of a region abounding in cultural and tourist activities. you cannot fail to discover the charm of Provence and Le Lubéron. - Bed linen is per packet available for an additional cost of 15 EUR p.p./stay. - Please note that the electricity fee of 8 EUR/night is not included in the room rate. - Air conditioning is possible for an additional cost of 8 EUR/night. - You are allowed to bring max. 2 pets/dogs with you for an additional cost of 30 EUR per pet/stay. Pets will only be accepted if communicated before arrival. This holiday home has air conditioning, oven and dining area.